2 | BROADBAND COMMUNITIES | www.broadbandcommunities.com | MARCH/APRIL 2015 EDITOR'S NOTE Broadband Communities (ISSN 0745-8711) (USPS 679-050) (Publication Mail Agreement #1271091) is published 7 times a year at a rate of $24 per year by Broadband Properties LLC, 1909 Avenue G, Rosenberg, TX 77471. Periodical postage paid at Rosenberg, TX, and additional mailing offices. POSTMASTER: Please send address changes to Broadband Communities, PO Box 303, Congers, NY 10920-9852. CANADA POST: Publications Mail Agreement #40612608. Canada Returns to be sent to Bleuchip International, PO Box 25542, London, ON N6C 6B2. Copyright © 2015 Broadband Properties LLC. All rights reserved. CEO & ED I TO R IAL D I R EC TO R Scott DeGarmo / scott@bbcmag.com PU B LISH ER Nancy McCain / nancym@bbcmag.com E D I T O R Masha Zager / masha@bbcmag.com E D I T O R -AT- L A R G E Steven S. Ross / steve@bbcmag.com ADV ER T ISI N G SALE S A CCO U N T E X E C U T I V E Irene Prescott / irene@bbcmag.com CO M M U N I T Y N E W S E D I T O R Marianne Cotter / marianne@bbcmag.com D E SI G N & PR O D U C T I O N Karry Thomas CO N T R I B U T O R S Joe Bousquin David Daugherty, Korcett Holdings Inc. Joan Engebretson Richard Holtz, InfiniSys W. James MacNaughton, Esq. Henry Pye, RealPage Bryan Rader, Bandwidth Consulting LLC Robert L. Vogelsang, Broadband Communities Magazine B R OA D BA N D P R O P E R T I E S L LC CEO Scott DeGarmo V I CE PR E SI D EN T, B USI N E SS & O PER AT I O N S Nancy McCain CHAI R M AN O F T H E B OAR D Robert L. Vogelsang V I CE CHAI R M EN The Hon. Hilda Gay Legg Kyle Hollifield B USI N E SS & ED I TO R IAL O FFI CE B R OAD BAN D PR O PER T I E S LLC 19 0 9 Ave nu e G • R o s e n b e r g , Tx 77471 281. 3 42 .9 655 • Fa x 281. 3 42 .1158 w w w. b r o a d b a n d co m m u n i t i e s . co m masha@bbcmag.com T he theme of the 2015 BroadBand Communities Summit – the same theme as for the 2014 Summit – is "Let's Gigafy America." Let's take a moment to think about that. 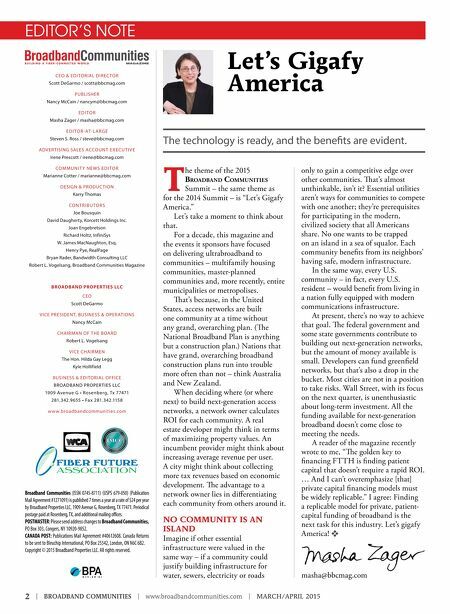 For a decade, this magazine and the events it sponsors have focused on delivering ultrabroadband to communities – multifamily housing communities, master-planned communities and, more recently, entire municipalities or metropolises. Tat's because, in the United States, access networks are built one community at a time without any grand, overarching plan. (Te National Broadband Plan is anything but a construction plan.) Nations that have grand, overarching broadband construction plans run into trouble more often than not – think Australia and New Zealand. When deciding where (or where next) to build next-generation access networks, a network owner calculates ROI for each community. A real estate developer might think in terms of maximizing property values. An incumbent provider might think about increasing average revenue per user. A city might think about collecting more tax revenues based on economic development. Te advantage to a network owner lies in diferentiating each community from others around it. NO COMMUNITY IS AN ISLAND Imagine if other essential infrastructure were valued in the same way – if a community could justify building infrastructure for water, sewers, electricity or roads only to gain a competitive edge over other communities. Tat's almost unthinkable, isn't it? Essential utilities aren't ways for communities to compete with one another; they're prerequisites for participating in the modern, civilized society that all Americans share. No one wants to be trapped on an island in a sea of squalor. Each community benefts from its neighbors' having safe, modern infrastructure. In the same way, every U.S. community – in fact, every U.S. resident – would beneft from living in a nation fully equipped with modern communications infrastructure. At present, there's no way to achieve that goal. Te federal government and some state governments contribute to building out next-generation networks, but the amount of money available is small. Developers can fund greenfeld networks, but that's also a drop in the bucket. Most cities are not in a position to take risks. Wall Street, with its focus on the next quarter, is unenthusiastic about long-term investment. All the funding available for next-generation broadband doesn't come close to meeting the needs. 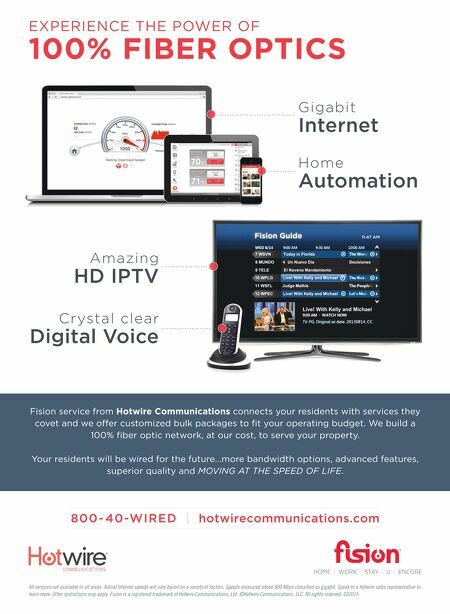 A reader of the magazine recently wrote to me, "Te golden key to fnancing FTTH is fnding patient capital that doesn't require a rapid ROI. … And I can't overemphasize [that] private capital fnancing models must be widely replicable." I agree: Finding a replicable model for private, patient- capital funding of broadband is the next task for this industry. Let's gigafy America! v Let's Gigafy America The technology is ready, and the benefts are evident.